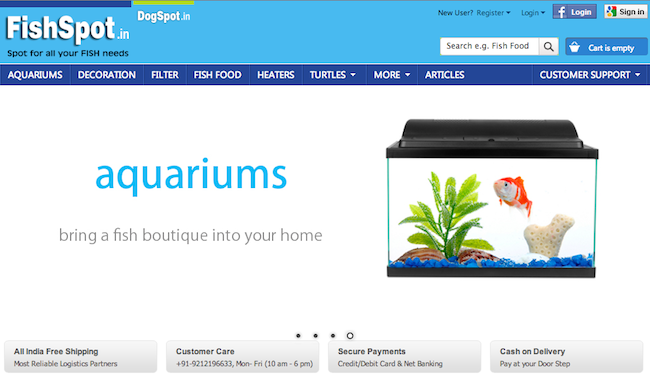 Petsglam Services Pvt Ltd, the Gurgaon-based company that owns and operates DogSpot.in, a one-stop online platform catering to all 'doggie needs,' has launched an identical platform catering to all 'fish needs' called FishSpot.in. The company had raised an undisclosed amount from early stage investment fund India Quotient in February this year. At the time, Rana Atheya, founder of DogSpot.in, had told Techcircle.in that the money raised by the company will be used for development of new sites and apps and for expanding its own range of products. He had said the company was planning to launch FishSpot focusing on fish products by March this year. The company is also planning to launch another vertical called CatSpot (for cat products) going forward. It may be noted that the company was already offering fish-related products on DogSpot earlier; if you click on these products on the site now, you will be redirected to the new site. Petsglam was launched in September 2007 by the husband-wife duo of Rana and Vizal Atheya. Initially launched as a blog, they started the e-commerce part of the business only in August 2011. In the same year, the firm secured seed funding from Vikas Saxena (CEO of Nimbuzz), Vaibhav Gadodia (vice president - tech,at Nagarro) and telecom consultant Ritesh Chauhan. It also raised an undisclosed amount from Tanjai Ventures and Kibo Partners in September 2012. When we checked, FishSpot offers products across six categories such as aquariums, decoration, filter, fish food, heaters and turtles. Once a category is selected, users can filter results according to popularity, price, brands and type. They can also search for a particular product via a dedicated search bar. The brands offered on the site include Sera, HiBlow, Tetra, Rainone, Aquaone, Waterlife, Rid-All, Tokyu, RS Electrical, Marina and Elite. FishSpot also claims to have exclusively partnered with Fluval, a leading aquarium product brand. The site currently offers over 700 products, while the plan is to increase these to 1,700 by September end. The payment options offered include credit/debit card, net banking and cash on delivery (which comes with a charge of Rs 50). For logistics, the company has partnered with Blue Dart, Delhivery and DTDC. While on FishSpot.in, users can navigate to the DogSpot anytime they want, although the reverse is not possible as of now (the company can possibly look into this). AskForPets also provides fish-related products and more; however, unlike Petsglam which is looking to launch a separate vertical for each category of pets, AskForPets is offering all its products (for dogs, cats, birds and even horses) under just one brand.